How to Save a Life by Sara Zarr. Grades 9+ Little, Brown Books for Young Readers, October 2011. 341 pages. Reviewed from ARC snagged at ALA.
Jill's just wishing things would go back to the way they used to be: her mother, her father, and her. But her dad's dead and her mom's going off the deep end and adopting a baby from some girl she met on the internet. Worst of all, the pregnant girl is coming to live with them until she has the baby. Between her on-again-off-again boyfriend and her friends whom she's driving away one by one, the last thing Jill wants to deal with is some hick town baby mama. Mandy's just hoping that things will never go back to the way they used to be: her mother, her mother's boyfriend, and her. Eighteen and pregnant, she's taking the train to a new place and putting her trust in a family she's never met, all in the hopes of saving her baby from the life she's had. But Mandy kind of needs someone to care for her, too. Could Jill's small family be the answer? Holy realistic contemporary, Batman. Sara Zarr is a superstar. Not only has she created a lovely story dripping with grief and yearning and hope and regret, but she's managed to do the nearly impossible and create two very distinct voices for her dual narratives. This is something that's so easy to do badly, but Zarr does a bang-up job. Not once would I have ever mistaken Jill for Mandy or vice versa. Their ways of speaking, of thinking, of looking at the world are completely unique and this shines through in their voices. Sara Zarr uses lots of details to create a strong sense of place. She's perfected the art of showing, not telling and while I was reading I felt like I was truly getting to know the characters. Secondary characters are well-developed and I enjoyed getting to know them, too. From Jill's eyeliner-sporting boyfriend to her boss at the bookstore to Mandy's white trash mom, these characters helped build a world. I could hear the snow crunching and feel the bitter cold of winter melting into spring. It's a sad story, oh yes. Jill's crushed by grief over her father's death and the reader feels it right along with her. Mandy's running away from something terrible and Zarr does a very nice job of slowly revealing Mandy's story while building tension. These are two characters that I will not soon forget. I'm still rooting for both of them, long after I've finished the book. 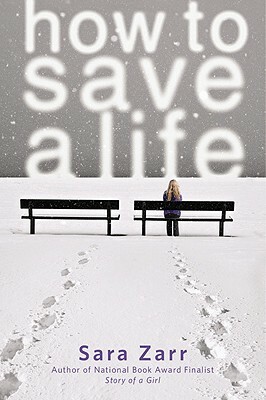 Check out another review over at The Book Smugglers and look for How to Save a Life ON SHELVES TODAY! !